Vault apps store photos, videos, and other apps, and they require password authentication to open. Then there are hidden apps which look innocuous — like a calculator — but are used to hide pictures and messages that teens don’t want their parents to see. Like vault apps, they typically require a password to access the content inside. Sometimes vault apps are even used to hide hidden apps, making the content inside even more difficult to access. They’re so secure that some will automatically snap a photo of a person if they use the wrong password. The danger with these types of apps is that they are likely used to house inappropriate content — usually explicit pictures, videos, or discussions. If you haven’t already set up parental controls on your kids’ devices, you may want to see if they have any of these hidden apps already on their phones first. Visit to the App Store on their phone and type in “vault app” or “hide photos” or “secret app.” If any of them have “OPEN” next to them (instead of “GET”), it means the app is already installed on their phone. If you discover that any of those apps are installed, you can try to open them to see what’s hidden there, or you can have a conversation with your child about them later. iOS devices have a hidden folder feature, where any photo can be hidden from the main photos. The hidden folder isn’t password protected though, so you can go in and view the photos your teen may be hiding there. Just go to the camera app, click on “All Photos,” then “Albums,” and then scroll through until you see the “Hidden” folder. Android users can hide files by simply renaming them with a period in front of the folder name. To see the hidden files on your child’s Android device, go to the “My Files” folder, then the storage folder you want to check — either “Device Storage” or “SD Card.” Once there, click on the “More” link at the top right-hand corner. A prompt will appear, and you can check to show hidden files. Sometimes teens will create a folder on their device and name it after one of their hobbies, or something like “Cat Photos,” where they’ll hide photos and messages thinking nobody is likely to open it. Since the nature of vault and hidden apps is to appear one day and be gone the next, it can seem a challenging task to stay on top of the newest version. However, there are some controls you can put in place to help guide your teens as they navigate the app world. The first step is to use Bark as a monitoring service — we will alert you to risky apps that are already downloaded on your teen’s phone, as well as those that are downloaded in the future. For iOS users, under the Apple Family Sharing Plan, the organizer (parent) can enable the Ask to Buy feature for the kids and teens in the family. That way when a teen goes to purchase or download an app, you can review and approve or deny it. Android users can also set up parental controls the Google Play store. Create a pin that your kids do not know about, and put in filters for apps, games, and movies by choosing the maturity level of the content you want to allow. You can also require a password for authentication for purchases in Google Play. Your teen would need your Google password to change these settings, so make sure it’s one they do not know. Additionally, you can set up a family payment method, where you can turn on purchase approval settings for family members. 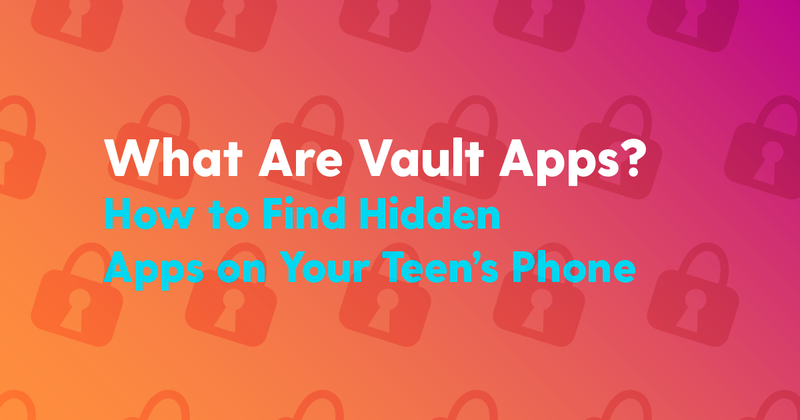 Because hidden and vault apps are usually used to conceal inappropriate content, it’s important to discuss with your teens why these apps are not allowed as part of your family’s technology rules. There may also be criminal liabilities for having underage sexually explicit photos and messages on their phones. If you can remain calm and understanding when having these discussions, your kids will be more likely to come to you when they have sensitive questions, and not just rely on the dubious advice of their peers. Thankfully there are resources for helping you talk to your child about sexting, as well as discussing the potential consequences of risky online behavior. It’s important to discuss with your teens how these kinds of apps are not allowed. Teens may know how technology works, but they do not always understand the ramifications of their actions. Signing up for Bark will keep your child safer online by providing alerts to potential issues like sexting. This can help you support your children in a positive way as they explore the digital world.